So, for example, if Herbicide A provides 30% control and Herbicide B provides 40% control of a target weed, the expected response when the herbicides are combined is 58%. Basically, we’d expect Herbicide B to control about 40% of the plants that Herbicide A left behind. So if the herbicides exhibit a synergistic response, the herbicides would provide much greater than 58% control when combined. Antagonism can also occur, if the herbicides provide much less than the expected response when they are combined. If two herbicides are synergistic, we can get better weed control, sometimes even at reduced herbicide rates. I’ve published two studies where we found synergistic interactions between herbicides, and in both cases it was very helpful for controlling weeds (Study 1; Study 2). However, herbicide synergism can be problematic if we don’t know about the synergistic interaction ahead of time. 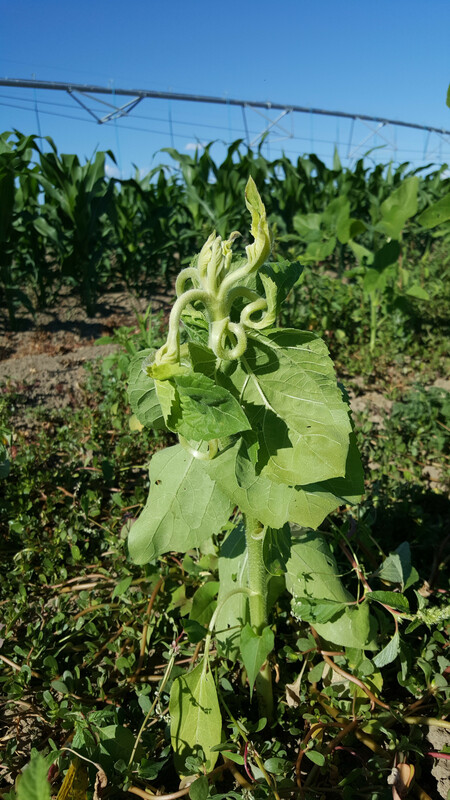 If the synergism isn’t known, it is possible that the herbicide mixture could cause injury to crops or other non-target plants. And this seems to be the reasoning behind EPA’s decision to withdraw the Enlist Duo registration. EPA, in their Enlist Duo registration decision, required a 30-foot downwind buffer between sprayed areas and ‘sensitive areas’ (which are defined as almost anything that isn’t a field, road, or parking lot). [The buffer is meant to protect non-target organisms from spray drift. More on spray drift here.] But EPA apparently didn’t know about the synergistic effects of the herbicide, and so wants time to re-evaluate whether the 30-foot buffer is enough given this new piece of information. The patent application at the root of this decision can be found here. 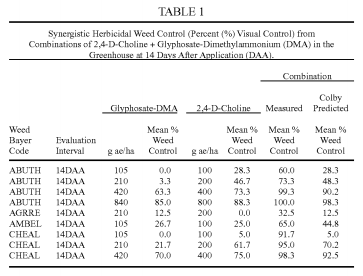 On pages 8 to 10 of the PDF file, Dow provides several tables that do seem to suggest substantial synergistic activity between the two herbicide active ingredients in Enlist Duo. For example, at very low rates, glyphosate provided 0% control of common lambsquarters and 2,4-D-choline provided only 5% control. But when the herbicides were combined at those same rates, common lambsquarters was controlled 92%! That’s substantially greater than the 5% control predicted by the Colby method. If the data in the patent application are reliable (and we have no reason to believe otherwise), then there does seem to be some significant synergism between these two herbicides. And if this synergistic effect wasn’t disclosed to EPA during the registration process, I guess I’m not too surprised by their desire to give this a closer look. UPDATE 2: I’ve been trying to find evidence in the literature about interactions between 2,4-D and glyphosate. There don’t seem to be too many reports of synergism. One paper (Flint & Barrett 1989) show synergism between these two compounds in field bindweed. But other papers (O’Sullivan & O’Donovan 1980; Flint & Barrett 1989) actually show that 2,4-D antagonized glyphosate efficacy in some grass species (wheat, barley, wild oat, and Johnsongrass). This suggests that the synergistic effects reported by Dow in their patent application may be specific to the choline salt of 2,4-D used in the Enlist Duo formulation. Hat tip to Luke Runyon for the story and the pdf.